The one question that never stops being asked by students is, “Why do I have to learn mathematics?” One could make the case that knowledge of math is essential for good citizenship and not just the “official” motives of utilitarian, political, and cultural expectations. 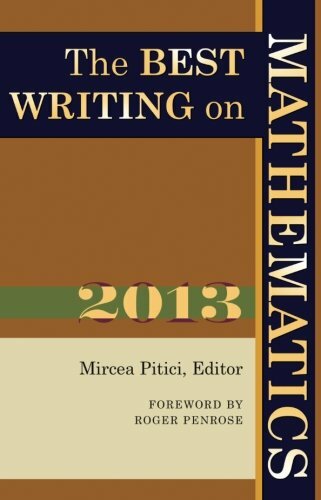 Another and perhaps more effective argument posed by Mercea Pitici, editor of The Best Writing on Mathematics 2013, is that mathematics is a form of communication used to remove ambiguity so that when two parties talk they can be sure they are talking about the same thing. The purpose of The Best Writing on Mathematics series [2011 and 2012 reviewed here also] is to make mathematics accessible to the general public and by her picks, Mercea shows that she is at the top of her game. Each year’s collection presents a different focus, though this year’s seems to be a bit less “gee whiz” in emphasis though more introspective. As in previous editions, most essays are comprehensible to a nonspecialist while the few that are more difficult to follow are relegated to the back of the book. In all cases a reader will discover the fine writing that makes this series a joy to read and own. This year’s collection includes eminently readable essays from such luminaries as physicist Roger Penrose, Charles Seife, Ian Stewart, and Donald Knuth, and a variety of mathematics topics are in attendance, including complexity, the statistics needed to tame complexity, fractals, and spectral analysis. There is an essay on patterns and randomness where randomness shows up not just in numbers but also in music and computer games. There are essays on mathematics in geometry and not just curves, polygons, and polyhedra but also typography, art and architecture, and a study of devices used to aid drawing in perspective. There’s an essay on early modern (between the 16th and 18th centuries) mathematical devices and their use that include astrolabes, sundials, quadrants, surveyor’s theodolites, and gunner’s sights. Mathematics in art and architecture are well represented, there is an essay on the mathematics of the Jerusalem Chords Bridge, a suspension bridge that is also a work of art. This bridge, although constructed out of straight lines has an envelope in the shape of a parabola. And believe it or not mathematics can be applied to high fashion. The clothing designer Dai Fujiwara and mathematician William P. Thurston collaborated and debuted at Paris Fashion Week 2010, though the collaboration was sometimes uneasy - while giving a series of lectures to the design team, the mathematician Kazushi Ahara had to promise not to use certain words like “equation” or “trigonometric function”. New to this series is an essay on the mathematics of networks, using empirical data enabled by social networks such as Facebook. All the essays are of interest but a few call out for special attention. Philip J. Davies in “The Prospects for Mathematics in a Multimedia Civilization,” addresses the impact of the computer and the web on aids to the mathematician. Davies notes that the title of his essay covers such a broad range of possible topics that it was difficult to pick a part to address, so instead he chose to write about the future. Davies’ guesses: there will be advances in applications, in physical and engineering sciences, in life sciences, military, entertainment, money, graphics, law, politics, education, and the work environment. Davies continues by philosophizing on social, psychological, and mathematical tensions: discrete versus continuous, determinist versus probabilistic, thinking versus clicking, and observation versus proof. In another selection of note, Ian Stewart, author of “Fearful Symmetry” looks at the mathematics in biology and chemistry that led to the creation of stripes and spot patterns in animal markings. The mathematics of biology was first attempted by Alan Turing in a paper on the reaction-diffusion model back in 1952. John Pavlus’ essay “Machines of the Infinite” recounts one of the most favorite topics of computer scientists: the basics of complexity, addressing the problem of P versus NP. Frank Quinn’s essay, “A Revolution in Mathematics?” addresses the revolution in mathematics that took place between 1890 and 1930 that cemented the difference between methods in mathematics and methods in science. Quinn claims that the obscurity of this transition has become a public relations disaster. Science - Find an explanation and test it thoroughly. Mathematics - Find an explanation without rule violations. B: I am a . . . The Best Writing on Mathematics also includes references to essays on mathematics that though notable did not make the cut, along with URLs of websites with mathematics videos, blogs for teachers, sites for exchanging ideas, and online university mathematics libraries. A reader who is a fan of mathematics (and of this series) may want to take two passes through The Best Writing on Mathematics 2013, the first for wonder and delight, the second slower and more thorough to digest concepts and investigate references.